Lisa Zidek and her husband are sitting on the couch, watching television, when they feel someone behind them, breathing on their necks. They aren’t alarmed. It’s just their dog, Buddy. He was about 4 months old when they adopted him. Now, just over a year later, “He has grown to be quite large,” Lisa says. “When I take him to the farmers’ market, people say, ‘Look! There’s Marmaduke,'” although she says he talks more like Scooby Doo. The family thinks he’s a Great Dane mix. 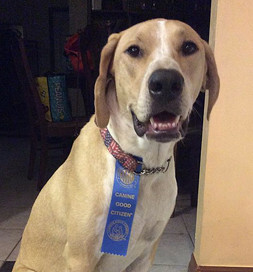 Buddy shows off his Canine Good Citizen ribbon. “Although we know he’s large, he thinks he’s a lap dog and often pulls the typical Great Dane move of slowly backing onto your lap if you’re sitting on the couch,” Lisa says. Lisa and her husband aren’t the only ones who sometimes sense someone behind them. For Buddy, though, it turns out to be his own tail, which is coming along back there–at some distance because he’s so big. He decides the tail is fair game and begins to chase it, running into walls and chairs until he gets distracted. The distraction might be something on TV because he’s a TV watcher. One evening while the Zideks were watching a nature show, Buddy saw a bug on the screen. He ran over and followed the bug’s movements, transfixed, until it disappeared. “Since then we look for nature shows with bugs,” Lisa says. Within 24 hours in his new home with three boys and two other dogs, the aloofness disappeared, and the clown came out. He loves to wrestle with Abbie, a Newfoundland/Labrador Retriever mix. Dudley, a Shepherd/Basset Hound mix “is the supervisor and will yell at them when he thinks things are getting out of hand. Buddy likes to snuggle with Dudley when he is ready for a nap or bedtime,” Lisa says. Soon Lisa, Joseph and Buddy will start their journey together as a therapy dog team. Good work for a good dog.